Shopping for a new Genesis G90? Despite its extra power, the 2018 Genesis G90’s optional V-8 isn’t an improvement over the strong twin-turbo V-6. The 2018 Genesis G90 is the modern interpretation of a luxo-barge—and it’s a great value, all things considered. The 2018 Genesis G90 is a full-size sedan with fuller size ideas of taking on established brands on their own turf. The 2018 G90 lineup sees few changes this year. The 3.3T Premium now includes standard LED headlights and the 5.0 Ultimate gains a rear-seat entertainment system. Both trim levels now include a CD/DVD player tucked into the glovebox. 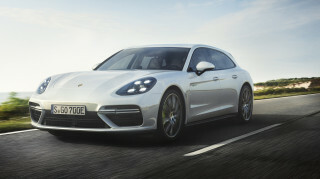 As its name indicates, the 3.3T premium features a 3.3-liter twin-turbo V-6 engine rated at 365 horsepower. The 5.0 Ultimate tacks on even more luxuries and swaps in a strong 420-hp naturally aspirated V-8 engine. Rear-wheel drive is standard on both and all-wheel drive is optional. Regardless of engine and drive wheels, an 8-speed automatic developed by Genesis-parent Hyundai is standard. The V-6 pairs nicely to the 8-speed automatic, and although it lacks the muscular engine note of the V-8, it’s our choice. The V-6 is more fuel-efficient at 20 mpg combined and its lighter weight delivers a slightly more nimble feel. The G90 performs its best on the open road thanks to an adaptive suspension and a long wheelbase that work together to swallow up miles and potholes with aplomb. Enter a corner and there’s considerable lean and the steering is too light for our tastes. It’s old-school luxury updated with high-tech features. Inside, the G90 features a massive 12.3-inch touchscreen display for infotainment with standard Apple CarPlay and Android Auto. 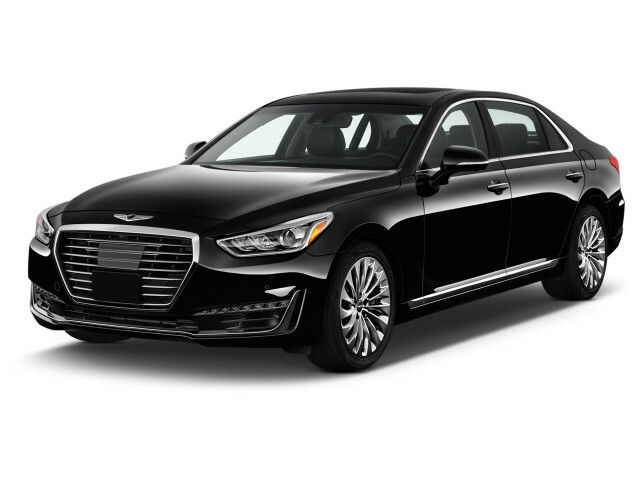 Befitting its flagship positioning, the G90 is loaded with goodies like a 17-speaker Lexicon-branded audio system, a 22-way power driver’s seat, and power-closing door. Its interior design is as restrained as its exterior with top-quality materials covering every surface. Notable standouts include metal-finished buttons for the climate control system. On the safety front, the G90 is loaded to the gills with automatic high-beam LED headlights that bend with steering wheel inputs, nine airbags, and automatic emergency braking with pedestrian detection. 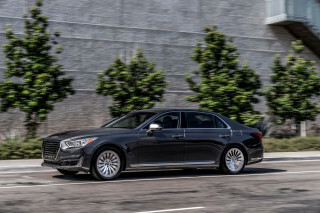 The Genesis G90 is unusual among luxury sedans in that it has been subjected to IIHS crash-testing, where it earns the coveted Top Safety Pick+ award. A study in understatement, the 2018 Genesis G90 flies under the radar without looking bland. Understatement is the 2018 Genesis G90’s modus operandi. 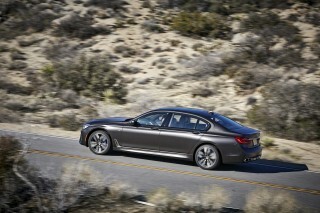 Its clean exterior styling is light on faults, but also light on personality. Our point above average here is awarded to its elegant interior. The G90 is long, with a commanding presence that looks fit for nobility—or at least for high-ranking government officials. It hides its girth relatively well, with a plain face up front, deeply scalloped sides, and taillights that swoop from the fenders back into the trunk lid at the rear. This sedan’s tall windows provide it with an airy feel from inside, but there’s some frumpiness to the rearmost roof pillar. Inside, the G90’s horizontal lines emphasize its stretch-out space. It’s elegant without being overbearing and we applaud Genesis’ designers for a look that will stand the test of time. One downside is that the G90’s interior isn’t available in the wide array of shades seen in so many of its rivals; your choices here are between black and beige. The 2018 Genesis G90 is at its best on a wide, open stretch of highway. Unlike competitors that try to be everything to everyone, the 2018 G90 is content being a pillowy soft luxury sedan. Two engines are on offer, each with strengths that ultimately don’t remake the G90 as anything but a cruiser. 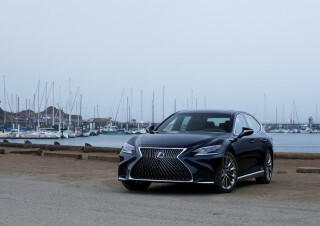 The base engine is a 3.3-liter twin-turbo V-6 rated at 365 horsepower and 376 pound-feet of torque and it’s paired to an 8-speed automatic and rear- or all-wheel drive. Included with the G90 5.0 Ultimate is a 5.0-liter V-8 that checks in with 420 hp and 383 lb-ft of torque. 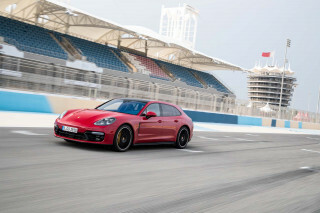 Few drivers will find the 3.3-liter engine unsatisfactory. It pairs well to the slick-shifting automatic with terrific passing response and a refined, demeanor that suits the G80’s gentle feel. The V-8’s prime asset is its sonorous engine note, but it offers only a hint of additional response. Stick with the V-6, we say. Either way, the G90’s suspension is the benchmark for suppleness. 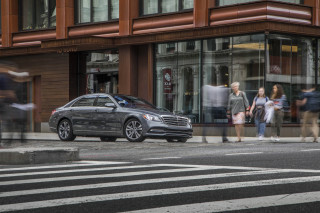 Comfort, Comfort+, and Sport modes for its electronically controlled shocks dial in a different ride quality, but even the latter hardly turns the G90 into a rival for sports sedans from Germany and Detroit. The G90 relishes highway cruising, where it blocks the outside world and settles in to eat up entire continents. Just plan your road trip carefully, the G90 feels out of place on a curving road. It’s planted, to be sure, but it’s not happy to be pushed and its overly light steering forces the driver to make corrections often on a winding road. There’s also considerable body lean, which is something the G90’s competitors have largely managed to squash while still retaining a comfortable ride. The 2018 Genesis G90’s luxurious feel hardly matches its modest price tag. There’s ample room for passengers, especially the driver. A 22-way power-adjustable driver’s throne is just the tip of the iceberg. 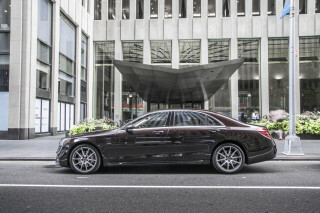 The long wheelbase provides limo-like accommodations for row two. The rear bench has been optimized for outboard passengers, but there’s enough space for three. However, the rear seat doesn’t fold down. That would be too gauche for a luxury sedan, even though Hyundai’s cheapest Accent has a folding rear seat. Responding to one of our complaints about last year’s model, Genesis has made a rear-seat entertainment system standard on the 5.0 Ultimate. Surprisingly, there is no first class-like rear seat arrangement with individual buckets and a wide center console. There is, however, plenty of room for large and small items. The G90’s trunk can fit nearly 16 cubic feet of cargo and its interior is littered with places to hide (and lose) smaller items like phones and pens. Most impressive is the G90’s serenity. Luxurious materials are found on every surface, and although they’re not exotic woods and metals, they’re authentic and finer than anything at this price point. Stainless steel, semi-aniline leather, and synthetic suede line every surface that isn’t glossy ash or walnut wood. The 2018 Genesis G90 has scored exceptionally well in what crash-testing has been performed so far. Unlike many large luxury sedans, the 2018 Genesis G90 has been crash-tested—and the results are impressive. 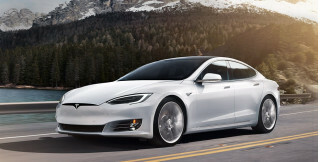 The IIHS awards the lineup its Top Safety Pick+ rating. Every G90 is fitted with a high degree of crash-avoidance tech like automatic emergency braking (with pedestrian detection added for 2018), blind-spot monitors, rear cross-traffic alerts, active lane control, adaptive cruise control, automatic high-beam LED headlights that swivel with the steering wheel, a head-up display, and a surround-view camera system. Nine airbags, anti-lock brakes, stability control, and seatbelts that cinch ahead of a crash are also part of the G90’s suite of safety gear. The IIHS gave the G90 top marks all around, including a rare “Good” rating for its LED headlights. Last year’s standard HID units weren’t as impressive, but the G90 has dropped those units for 2018. The 2018 Genesis G90 is equipped like a proper luxury sedan and owners won’t ever have to set foot in a dealer’s showroom. The G90 is available in 3.3T Premium and 5.0 Ultimate trim levels. There’s nothing groundbreaking about the level of equipment on both Genesis sedans, at least until you consider their stellar value equation. The lineup starts at around $65,000 and tops out about $10,000 higher. No rival comes close. The G90 3.3T Premium is fitted with nappa leather, power front seats with 22-way adjustment for the driver and 16-way for the passenger, heated and cooled front seats, a heated steering wheel, three-zone climate control, and Lexicon-branded audio. Pop for the 5.0 Ultimate and you’ll get the V-8 engine, a rear-seat entertainment system, power-adjustable and cooled rear seats, and rear vanity mirrors. All G90s have a 12.3-inch touchscreen for infotainment that includes Apple CarPlay and Android Auto. In addition to the screen’s big size and crystal clear display, its software is a cinch to use. Other luxury brands should take note. And the G90 isn’t just luxurious on its own. 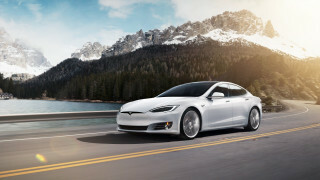 The automaker’s sales team will deliver one to a prospective buyer to test out. After buying one, owners are treated to three years of maintenance, satellite radio, map updates, and emergency roadside service. A valet will fetch the G90 for servicing and leave owners with a loaner, even for minor things like oil changes. If there’s any downside to the G90, it’s that it doesn’t go far enough for some luxury buyers. Seven exterior paint hues are on offer and they can be paired to one of two interior shades. Competitors offer far more customization. The 2018 Genesis G90 isn’t particularly fuel-efficient. Genesis G90 sedans with the twin-turbo V-6 are the thriftiest. There’s no penalty for rear-wheel drive, though: both versions score 17 mpg city, 24 highway, 20 combined. The G90 5.0 Ultimate isn’t that much thirstier. 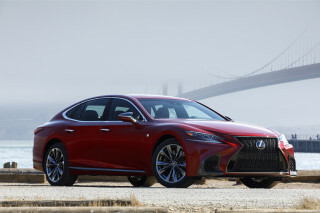 Rear-drive versions come in at 16/24/19 mpg, while the all-wheel-drive model scores 15/23/18 mpg. Genesis recommends premium fuel for the G90. Excellent car, quiet, reliable, safe and a value oriented luxury vehicle. I got a great deal and great service on a 2017 G90 from Van Hyundai. ! Beautiful Car, handles better than my Equus. The people at Van Hyundai made it very easy with great service and attention by all the staff, especially Igor! Thanks folks! Looking for a different year of the Genesis G90?